Liverpool came from behind to beat Burnley, Wolves stunned Chelsea, and Manchester United and Arsenal played out a frenetic draw in the Premier League. 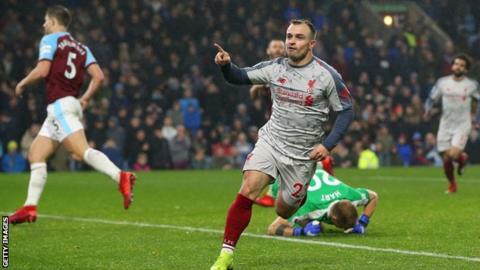 James Milner drew a much-changed Liverpool side level at Burnley, before Roberto Firmino came off the bench to score and Xherdan Shaqiri sealed a 3-1 victory to bring the Reds back within two points of Premier League leaders Manchester City. Shkodran Mustafi and substitute Alexandre Lacazette put Arsenal in front in each half against Manchester United, only for the home side to swiftly reply each time through Anthony Martial and Jesse Lingard. Wolves also came from behind to upset Chelsea 2-1 and claim their first win in seven Premier League games, Raul Jimenez and Diogo Jota scoring either side of the hour mark. New Southampton manager Ralph Hasenhuttl watched from the stands as Harry Kane's early strike set Tottenham on course for a 3-1 win at Wembley. Claudio Ranieri welcomed former club Leicester to Fulham and although Aboubakar Kamara gave the hosts a half-time lead, James Maddison earned the Foxes a deserved point. Salomon Rondon's opener for Newcastle was cancelled out by Richarlison before the break to earn Everton a 1-1 draw at Goodison Park.